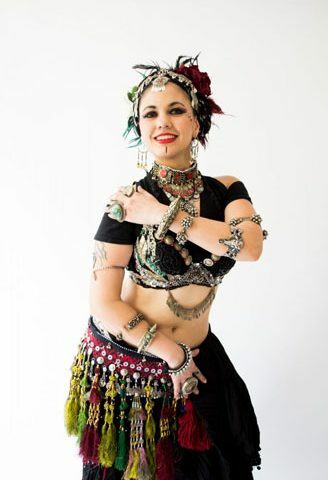 My immersion in bellydance started in 2004 and kept researching and studying with professional teachers and dancers from all over the world coming to Mexico where I live and run my “Dakinitri Bellydance” Sister Studio. In my quest to keep on learning and tracking the roots of this beautiful dance I have taken 350 hours of Odissi in India in 2013 and 2014 at the Shakti School of dance with my beloved teacher Colleena Shakti. I am also in the process if getting certified as a Datura Tribal Fusion Bellydance Style teacher by Rachel Brice” in Portland, Oregon. I love teaching in other countries and cities I have been doing so since 2009 including Asia, South America and Europe also I have performed in many National and International Festivals. I have the firm belief that, “I haven’t taught until my students have learnt”, as John Wooden would say. My priority is to be contagious to my students and to transfer the passion I feel when I dance this art life form.